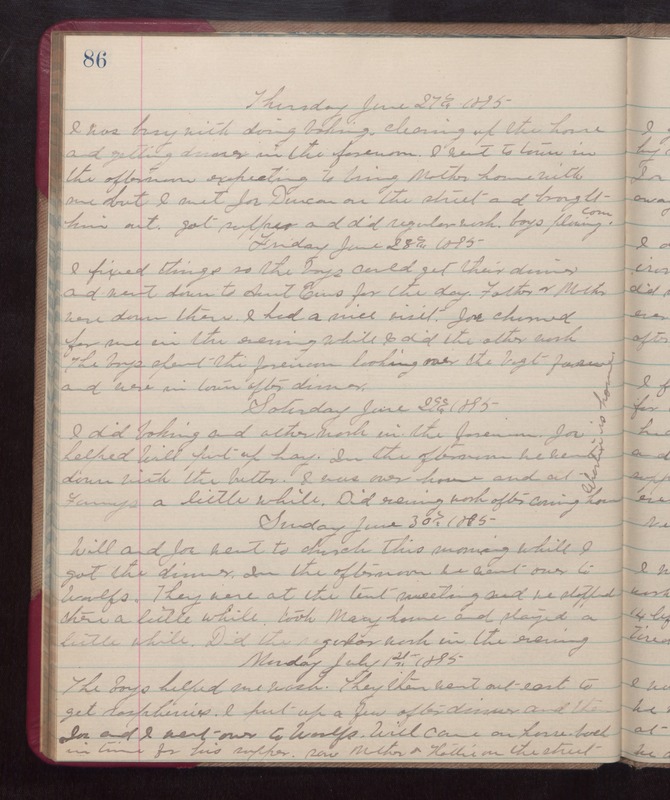 Thursday June 27th 1895 I was busy with doing baking, cleaning up the house and getting dinner in the forenoon. I went to town in the afternoon expecting to bring Mother home with me but I met Joe Duncan on the street and brought him out. got supper and did regular work. boys plowing corn. Friday June 28th 1895 I fixed things so the boys could get their dinner and went down to Aunt Ems for the day. Father and Mother were down there. I had a nice visit, Joe churned for me in the evening while I did the other work. The boys spent the forenoon looking over the Vogt farm and were in town after dinner. Saturday June 29th 1895 I did baking and other work in the forenoon. Joe helped Will put up hay. In the afternoon we went down with the butter. I was over home and at Fannys a little while. Did evening work after coming home. [the following text is written vertically in the right margin of the above entry] Charlie is home. Sunday June 30th 1895 Will and Joe went to church this monring while I got the dinner. In the afternoon we went over to Woolfs. They were at the tent meeting and we stopped there a little while. took Mary home and played a little while. Did the garden work in the evening. Monday July 1st 1895 The boys helped me wash. They then went out east to get raspberries. I put up as few after dinner and then Joe and I went over to Woolfs. Will came on horseback in time for his supper. saw Mother and Hattie on the street.